The Transfer Box is a device specific to 4x4 vehicles. 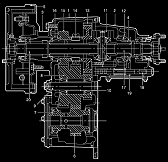 It is essentially an extra Gearbox attached to the back of the main Gearbox that controls the selection of High and Low ratios. This doubles the number of gears available to the vehicle whilst simplifying their selection. On a Land Rover, the Transfer Box is also responsible for locking the central differential between the front and rear propshafts. Specifically, the Transfer Box transfers power to the front propshaft, which is also connected to the differential, which sends on power to the rear propshaft. When the differential is locked, it is effectively removed and power to both axles is constant. The Transfer Box also takes the speed measurement for the speedometer from a worm gear on the outside of the output housing. The LT230 has been known to be quite strong and so wasn't fundamentally changed that often. The LT230 Series had different High range ratios depending on the model. NB: The figures show how many revolutions of the gearbox it takes to move the propshafts one revolution. The LT230 series' had the same Low range ratio for each Land Rover model. The Transfer Box is prone to leaking oil. Whilst a leak from the front output housing is apparant from its location, a drip from the rear output housing seal manifests as dripping from the handbrake drum. The cover plate has a tendency to drip oil, which is very likely to be a seal on the intermediate gear. At one end it is quite accessible, but the other is quite inacessible, having to go through the cubby box hole above.